Suhad Zoabi, Or Berkowitz, Jack Lavan, Noam Vowell, Alex Yudilevich. Stereoscopy in space is the spatial three-dimensional or “stereo” observation of related 2-D images, showing the same object under different viewing angles. The Earth stereo images from orbit enable map-making for many civil and military applications. At present time the stereo plotting application amounts 11% from all spaceborn Earth observation and the needs for topographic data in the world steadily rising. However, stereo space observation ability is very restricted, the satellites with stereoscoping imaging sensors are large, heavy and expensive. In this connection, the enlargement of space observation system capability to acquiring imagery for Earth stereoscopic coverage is very actual task. 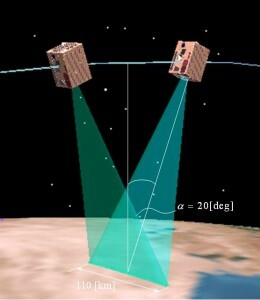 The DUSAT project consists of two identical Low Earth Orbit (LEO) microsatellites, designed for simultaneous three-dimensional mapping. This system is an attractive alternative to traditional large single satellite for Earth stereo observation mission. Small satellite low cost technologies, rapid delivery satellites for new constellation, high level redundancy, twin satellites orbital operation and ground station were examined in the DUSAT project. The project began with a wide literature survey and the study of the satellite different subsystems. The project team performed mission analysis, studying several options for LEO orbits suitable for stereo observation. The COTS, miniature components were widely used and new space design approaches were examined throughout the project. The project provides an overview of the DUSAT mission and the design process, as well as details of several aspects of the satellite and its subsystems. The DUSAT project demonstrates that the approach of microsatellites constellation can challenge the schedule, cost, reliability, simplicity and stereo imaging properties of a large satellite solution. The DUSAT couple uses oblique photography in 20 degree from the zenith, which is the optimal angle for the 3D image processing (Fig.1). The two satellites occupy the same sun synchronous circular orbit, with altitude of 550 km, inclination of 97.4 deg and local time of descending node at 10:30 AM. The distance between the satellites is 394 km, and this form the stereo basis for Earth imaging. The distance from satellite to target scanned area is 576 km. The swath of the cameras, that photograph the same Earth area from the satellites, is 110 km, and the spatial resolution is 10 m. Orbit repeat time about 25 days. 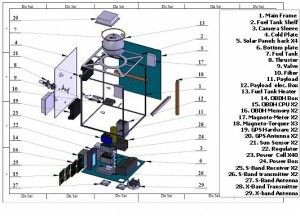 The final unfolded satellite configuration with detailed specification is presented in Fig.2. The satellite total mass including remote sensor and separation system is less than 95 kg. The images are transmitted to the ground station at Kiruna (North Sweden.). Satellites accesses with this station occur on 9 revolutions per day (from 16 daily revolutions); at that total access time is 51min per day. The DUSAT system can achieve global coverage in 25 days. The project shown that stereoscopic data from twin microsatellites allows for the derivation of topographic information. At that, a pair of identical microsatellites represents more cost effective and low complexity solution for stereo Earth observation than traditional missions. The lifetime of the DUSAT system is 3 years, with reliability 0.8.The total cost of proposed stereo observation system, including space and ground segments, is about M$32. This cost is considered inexpensive in comparison with some hundred M$ cost of analogous large satellite observation system. Verification was conducted using simulations of satellite’s operations by programs: STK (ORBITS), SIMULINK-MATLAB (ADCS), SOLIDWORKS (Structure characters), MATLAB (Power balance, reliability, etc.). This Project is presented for Student Project & Research Competition on the 47th Israel Annual Conference on Aerospace Sciences, 2007.